Are you needing a new couch, but are having a difficult time choosing one? There’s more to selecting a couch than just comfort. You probably know that choosing a pretty fabric is in the cards, but here is a step-by-step guide to walk you through the process. Caps cannot help me emphasize this enough – MEASURE YOUR SPACE! Can your room accommodate a large sectional? Or is it better suited for a small, apartment size sofa? And if it IS a large room, should you get one or two sofas? No matter what, you need to make sure you have at least 30″ (and preferably 36″) clearance for people to walk by on either side. Once you have your room measurements in mind, it’s time to pick a style of sofa. 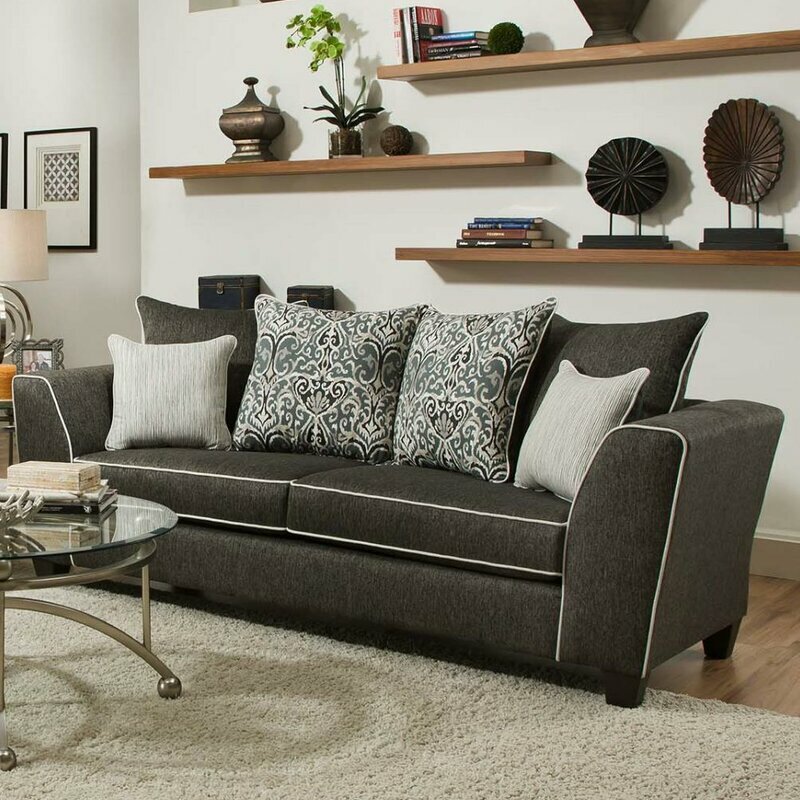 You’d be surprised at how many choices you actually have – sleeper sofa, love seat, sectional – and each come in a variety of sizes and separate styles. This is where function is key and very specific to your situation and space. The bottom cushions of your couch are probably the most used piece of furnishings in most people’s homes – aside from their mattress. So getting what you want is important. There are options of a single cushion that spans the seating length of the sofa. You can also have the same number of cushions on the bottom to match the cushions on the back of the sofa. Or a combination. Do you want a single cushion to sit on? Or do you want multiple cushions? The charcoal colored sectional above, for instance, has T-shaped cushions (see how they hug around the front of the arm? ), while the taupe couch just below it has square cushions (they are the depth of the arm). While these kinds of decisions may seem minuscule, they do impact on the look and feel of a couch. Ultimately, it’s personal preference. As for back cushions, the biggest decision would be whether you want them attached or detached. I prefer to be able to remove them and make the sitting (or lying) space larger. It’s like adding a twin sized bed to your sleeping options and is great for company or a marathon movie night! Whoa. Who knew choosing a couch had so many options?! Want to learn a little designer lingo? Let’s talk Track Arms. This style is straight and narrow and are great to use when space may be limited. They are a little more contemporary because of the sleek lines (both gray couches above have track arms). Or if you’re a little more traditional, the rolled arm (below on the leather sofa) would be a safe selection. There are so many options to choose from that we will barely scratch the surface today But here are some options for you to check out: if you want a contemporary look, you may want to go for a Track Arm with a Box Edge Back, but for a more traditional look, try a London Arm with a Loose Back. Next, is picking a pattern and finding your fabric. It might be tempting to just think of aesthetics, but durability and functionality are just as important. If you have kids, pets, or a messy spouse, you would be surprised at the range of options you’ll have due to newer fabric technology. “Performance fabrics” like Sunbrella and Perennials are accessible via quite a few retailers, and your favorite interior designer can select fabrics that have Crypton or Fibre Guard technology. So don’t give up your dream of having a light colored sofa AND living on it. Next is fun task of choosing the hardware and smaller details. These include your leg type, which can range from very detailed to very plain. 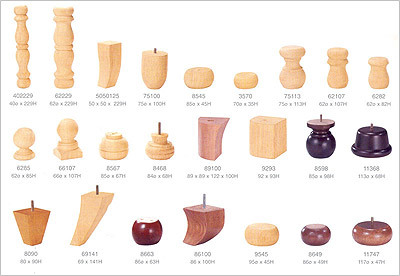 Below are the main wood styles available today and doesn’t even include metal or acrylic options. The “last step”, so to speak, is choosing your accent pillows. It’s important to make sure the fabric and colors work well with the overall design of the sofa, but most importantly, just have FUN with it. Pillows are much easier to change out than the actual sofa, as you can imagine! I love changing my pillows every autumn and springtime. Aaaannnddd…a shameless plug: We sell pillows on the website. Below are just a few options (as shown on the couch in the studio) in addition to some of the other fun stuff! And full disclosure, I may or may hot have taken a nap on one or two of these. And speaking of naps, one of the most important factors of buying a new couch is to make sure it is comfortable and nap worthy. If you need help deciding which couch to select – and a room full of furniture to finish it – give us a call! (972) 248.4733.